It is all about location at the Belfrey! 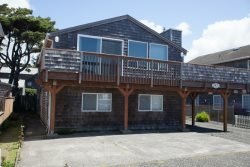 You will find yourself steps from the beach in this coveted location at the south end of Cannon Beach. Discover Silver Point, the Needles and miles and miles of sandy beach to savor far the crowds. The Belfrey is a traditional Cannon Beach cabin, and it’s charm will remind you of the simpler times from days past. Enjoy a cup of coffee on the cozy front porch while you let the sights and sounds of the Pacific wash over you. Step inside to find a bright living room with a peek view of the ocean. A gas stove will warm you after watching the sun rise and set on the beach. There is seating for six in the eat-in kitchen, where you will find everything you need to stay in and cook a meal. The Belfrey has two bedrooms and a bathroom with a shower. The first bedroom has a king-sized bed and the second a queen-sized bed. There is a sleeper sofa and a futon in the living room that together will provide enough sleeping spaces for your family and friends. The Belfrey will welcome your entire family, dogs included, and there is a small, completely fenced backyard that will make travelling with your pets easy! Friendly, efficient, responsive, clean. We absolutely enjoyed our stress free stay. The wonderful ladies at the office stopped by with a nice bottle of wine, and a congratulatory card. We were very pleased with the cleanliness. We especially liked the recommendations for restaurants. The weather was terrible, but we expected that. The only awkwardness was in finding things in the dark and rain when we arrived. Reflective street signage would have helped.